I love this buffet. It was my great-grandma’s dining room buffet before it was handed down to my mom. She recently inherited a piano from my grandpa and didn’t have room any longer for this so she offered it to me…on one condition: I must not paint it! I explained to her that in it’s current condition (above/before shot), it was disrespectful to leave it as is. It has years of neglect, a broken drawer, faded spots, rings from cups being left on it, missing hardware, etc. Want to see my secret solution? With the help of my dad/next-door-neighbor (hubby was at work), I cut the drawer apart and added hinges so we could tuck our cable box inside and simply close the drawer when the tv is off. Brilliant, right? I’m not going to lie, this project was way out of my league. I’m so glad my dad is handy and took over for me. All I had to do was screw in the hinges, and I stunk at it! My hubby came home and dremel’d out the space for the hinges so it actually functioned, LOL! So I stink at turning regular drawers into hinged drawers, but at least I can paint decently. Right?? So let me have it: my mom says I should prepare for some backlash…would YOU have painted your great-grandma’s 100 year old buffet?? Or am I insane? Wicker comeback: Love it or Hate it? I LOVE it! It's still sentimental even though it is now yellow! I say don't feel guilty! I would have painted it. LoOVE it! My grandpa had one almost exactly like it…wonder if I could get my hands on it?.. LOVE that hidden drawer thing – genius! yes, I would have painted it! I have a couple of pieces in my home that "I'm not allowed to paint!" …and I'm embarrassed of them, and can't wait to get something to replace them! If I could just paint them, I'd LOVE them! Be Proud of them, even…I'm glad you were brave! I'm not brave enough to defy my MIL! I love vintage pieces like this and this one turned out great. I especially love the hinged drawer. I think that making old vintage pieces (even heirlooms) relevant and fresh is better than leaving them old and neglected. I have this rule: "I can paint anything I buy, but not furniture passed down in the family" BUT in your case, with it really in need of help, I probably would have painted it, too! Your grandmother would love the bright cheery yellow! Well done! You did an awesome job! I love your solution for the cable box. I inherited my grandparents' buffet that I'd love to paint, but I'm scared to take the leap. YEP! I just got one last summer from my Grandmother and you better believe that puppy is going to be painted as soon as we move into our own home so I know what color I want it. And funny thing… We did exactly what you did to the top drawer! FABULOUS! We also did it to the bottom drawer for our video game console!!! I love your buffet! I have one almost exactly like it that was already painted green when I bought it in a little cottage furniture shop. But I was never crazy about the green color. A little dark. You have inspired me to paint mine and I was just thinking tonight about doing it, and then saw this post! I am excited! Yay! I'm so glad you're inspired!! (: And I'm happy no one has berated me, LOL! I love that old furniture can come back to life with an affordable option, paint! I love it and I think it looks GREAT! I follow your blog and I can't get over how much our rooms are similar. I'll try posting a link of my front room… Scroll down in the post a bit! I love this! This piece further feeds the yellow mood I have been in – gotta paint something yellow now! Please stop by my linky party happening now to link it up – I would love to have you there! Oh, I LOVE it!! I love that you left the top the same (only because I am totally a sentimental person) but, you picked the perfect color and honestly, I bet your great grandmother would love that you put some love and care into it. It is GORGEOUS! I wish you lived closer and could help me as I am slowly redoing my front room. Sigh. Oh! It turned out beautifully ! Go bold or go home with that yellow!! It's perfect! I've got a similar piece my mom is pushing me to take now- which would make it a tv console- cause I just don't have the space for anything else. Annnd, I used to have the couch set to match the leather chair you have in the corner! Funny! I love how this buffet came out! You definitely did the right thing. And I bet your great grandma would agree. Sentiment is ok, but that thing needed some tlc, and you gave it that. Well done. This is beautiful! I love the bright yellow. I saw your granite eggs on Its Overflowing. They were awesome! I'm a new follower. I'd love for you to follow me back, but no pressure! Gorgeous! The mustard yellow looks like it belongs on this piece. 🙂 I have some similar wood pieces inherited from my grandmother that I'm semi-terrified to paint (I'm not as good as you, Kelli!) but I know ultimately she would be okay with it because she always wanted me to be happy. 😉 I love that you left the top alone to help keep her spirit with you! 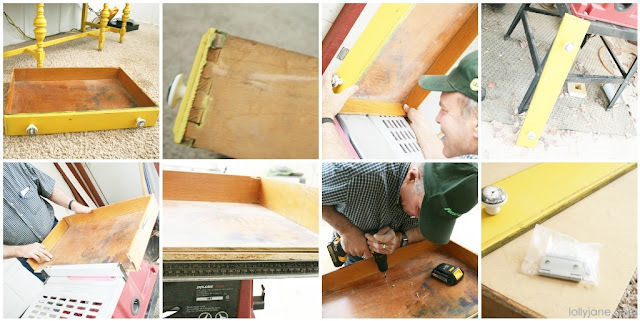 Old furniture gets new life with paint! I LOVE this console!! I personally would have no problem painting my Grandmother's 100 year old buffet – it has a whole new life now! Great job! Love the little hinged drawer! You have rescued this 100 yr. old dinosaur and turned it into something of beauty and interest! Had it stayed the way it was, it would have been relegated to your attic or basement to collect dust and eventually die. Love the yellow! Am getting reaady to do an old family dresser for a guest room. Would you mind sharing what shade and kind of paint you used? Thanks for the inspiration and the nudge to go yellow!! FYI: I write back every.single.person that comments but a good handful of you are no-reply bloggers. Sad! So if I ignored your cute comment, it's not on purpose (: Promise! Love the yellow and the little door! My philosophy is that if you are giving a piece new life and new love, then it's all good! How sweet to have a piece of your family right there with you! This color is magnificent! Love the hinge idea – brilliant! I also love the top staying wood…gorgeous makeover. This turned out gorgeous! The color choice was perfect! No backlash here. I'd paint it in a minute. Now you have something that you love AND it has sentimental value. Perfect! It looks amazing. Nope. You did good (ok, awesome is more like it)! And I like how you left the top the way it is! Saw your post on TT&J! I love it!! SO clever with the hinged opening! And, the color?? LOVE! The color is beautiful! I never wouldve though the before and after were the same piece. 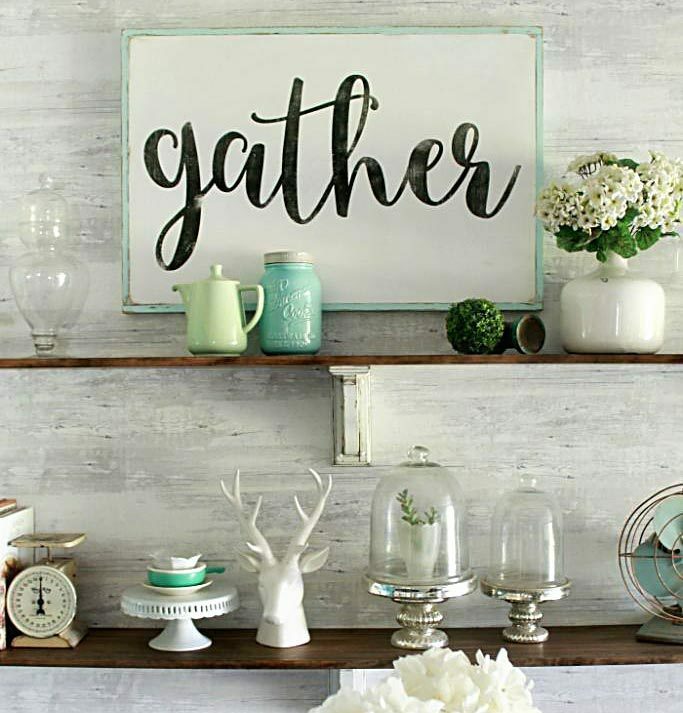 THis is so darling, it makes me want to redo my family room…. in something yellow! GORGEOUS. And, yes, you did right and you did good. I'll bet Mom is even proud of the makeover that her Mom's buffet received. Every old girl can use a little makeup now and then. I found you at the Bloghop posted on my page, PICKINandPAINTIN.blogspot.com. Im now following you and hope that you'll follow back. this is soooo pretty! I love the color! I recently redid a buffet and I painted it white- seeing this makes me ready to do it again, only in yellow this time! The buffet was gorgeous as is, but now that you painted it, it is stunning! I am in love with it! I am definitely featuring it on Tuesday! Thanks for coming by to link up…I would love to have you back this week! I absolutely love the yellow, and it looks so great now!! I re-did a vanity for my daughter and painted it bright pink http://sewsweetcottage.blogspot.com/2012/03/antique-vanity-redo.html and I think painting antiques a bright color brings them back to life!! I am totally in love with the buffet and the color! I am getting ready to finish up something in that color as well..I must say I felt a little intimidated by the color, just alone make a really strong statement. I like the little distressed it, it looks complete like that! Great job! I love it! I have been wanting a buffet for an entertainment center for a long time. I love the hidden compartment for your cable box. Looks great!! I wouldn't have thought twice about slapping some paint on the mamma jamma. Lol. 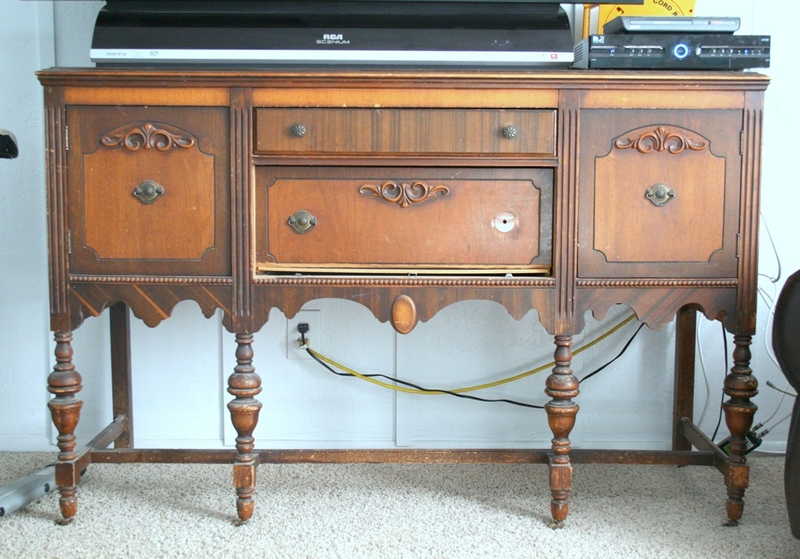 I recently scored an awesome vintage buffet from the thrift store that I plan to use for the same purpose as a TV stand. And it has tons of storage for the kids stuff! I think you are Insane-ly Talented. Great Job, don't you love it when a plan comes together. fabulous! i love the color! it's gorgeous! 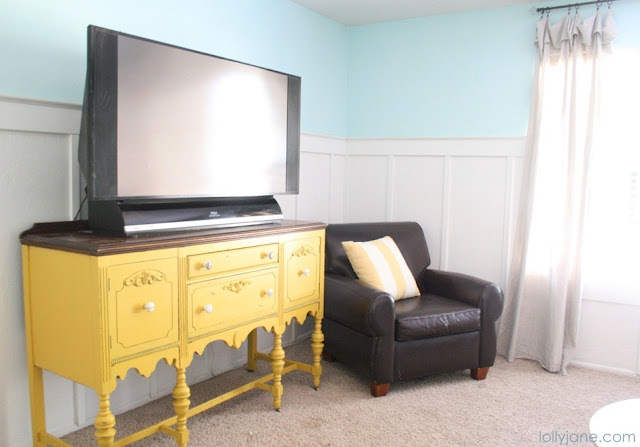 I adore that mustard yellow paint…who would have thought! I'm about to undertake the restoration of a dressing table to make a office desk. It has sweet curved drawers, lovely legs and a square front that I am not even sure what call it! Best of all, it has original glass nobs to die for! I can't believe I found this blog! I don't know if you remember me but I used to be in your ward. I'm happy to be a follower! It looks amazing! Painting it was a great choice! My dream is to one day paint an old upright piano to put in my living room. Don’t feel guilty about having painted it. It looks lovely. I would never have painted it personally. My hubby and I like the traditional look. So, your buffet would have been restored at my house along with your cute little trick! Just so you know I also have my Great Grandma’s Buffet. My Grandpa had left an iron on it and it burned right through the one inch thick oak top! It was quite the site when I received it. It has an oak veneer top and it beautiful piece of furniture again! Plus I love the storage it provides! I bet you do too! To be honest…I don’t know that I would paint a family heirloom (my mother might kill me)–but I *do* think yours looks amazing!! I love how this turned out-and the clever hideaway for your cable box. Mustard yellow has been one of my recent faves for painting furniture-and YES I would have painted over an heirloom (and have done just that). I really don’t get why some people get so upset about painting furniture?? Great job! That yellow is a breath of sunshine! My husband loves your hinged drawer. Aren’t you smart! just bought a beautiful dress in this shade! love it! found you via MMS’s party where i’m partying too. would love to have you as a follower. I totally love it! I would have totally painted it!!!!! I love it! it’s absolutely beautiful! i love that you kept the top intact to show off its history. I like how you’re using it as a tv stand. I have mine on an old drop-leaf table. I am currently in the middle of a family room redecoration and have been trying to decide what to do to the table and you have inspired me to paint it! Thank you! Glad to hear we’ve inspired you! Good luck, hope it turns out amazing!! So I have this huge buffet that is similar to yours, also being used as a tv stand. I bought it at a thrift store with the precise intent of doing just what you’ve done – painting it and making it beautiful again. It has been two years and I haven’t gotten to it, but your post has inspired me! Thank you for showing me what I need to do. And I love changing the top drawer into a space for the electronics. You’re fabulous!!! That is gorgeous! Love it! I think if it is going to be in your house YOU should love it. Luv, Luv! Such a pretty color and all the woodwork looks amazing with it! LOVE IT!!! The color is FABULOUS! My Mom has an old buffet too… fingers crossed that I can put my hands on it someday! Did you sand the buffet before you painted it? AWESOME! Do you have a recommendation of type of paint/finish so that the paint doesn’t peel off? Did you use a sealer? Late reply..just saw this sorry! We love our BB Frosch wax!! It cures in 30 mins and leaves a soft finish: https://www.etsy.com/listing/203414501/chalk-powder-starter-kit? I literally have this same exact buffet! And I took a small survey b/c I had mixed emotions about painting a 100 year old piece of furniture. Everyone said PAINT IT! So I will be off to Lowe’s this weekend for the paint! Thanks for the great idea!